Texas coach Shaka Smart called an easy play on the first possession of the game last weekend against Oklahoma. Throw it inside to Jaxson Hayes. The 6-11 forward caught the ball just off the block, buried his shoulder, tried to bully through his defender and got called for an offensive foul only nine seconds after tipoff. But the Longhorns had the right idea. Get the ball inside. Again, again and again, especially on Wednesday night against Baylor (18-9, 9-5 Big 12). 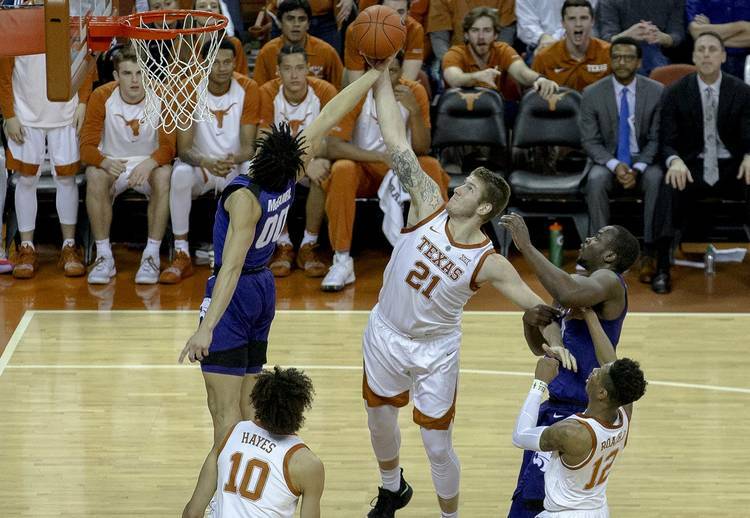 The Longhorns (15-12, 7-7) aren’t going to make the postseason if they don’t rely on their big men in the final four games of the regular season. Texas’ guards are average shooters at best, and UT is the second-worst 3-point shooting team in the Big 12. The Longhorns are shooting 52 percent from inside the arc, good enough for fifth in the league. That includes a slew of dunks and easy layups from Hayes, the league’s No. 1-ranked shooter at almost 75 percent. No other Big 12 player is shooting better than 70 percent. Texas’ leading scorer, senior guard Kerwin Roach II, remains on indefinite suspension. He’s averaging 15 points per game and listed among the top-10 scorers in the league. Smart hinted that Roach may not travel to Waco for the mid-week game after letting him go to Norman last weekend. It’s unclear when Roach will be reinstated. After Roach, Hayes (10.4 points) ranks 24th and 6-9 Dylan Osetkowski (10.2) ranks 28th in the conference. Guard Matt Coleman III (10.1) is the last player listed among the league’s top 30. He’s averaging 1.1 made 3-pointer in 27 games this season. Jase Febres, whose only role offensively is to shoot 3-pointers, averages about two made 3-pointers per game. Freshman Courtney Ramey is developing, but he’s not a dynamic long-range threat just yet. History has shown if Texas gets into a 3-point shootout, it doesn’t end well. This team’s end-of-game execution and long-range shooting has been atrocious — see Oklahoma State, Kansas, TCU and OU for examples. Texas ranks fifth in the Big 12 in 2-point field-goal shooting and ninth in 3-point shooting. Thus, it’s imperative the Longhorns bang away in the paint and get as many high-percentage opportunities as possible. Both the Longhorns and Bears are angling for NCAA Tournament positioning here in late February. The Bears are in a better spot, having already secured at least a .500 record in league play — long seen as the minimum for secure NCAA entry. The Longhorns are sitting at .500 with four games left. Without Roach in the lineup, Texas could struggle in all four going into the Big 12 tournament. The Horns won’t have a puncher’s chance against anyone in March if they don’t focus on their strength and work inside out. Hayes certainly knew it after the OU loss.